Yomi is a competitive card game by Sirlin Games that is themed around traditional fighting games like Street Fighter. Yomi was developed by the lead designer of Street Fighter HD Remix, who was also a long-time fighting game tournament player. The game holds the distinction of being named "the best game of 2010" by Tom Vasel of The Dice Tower. Digital versions of the game are available for Web (Unity WebPlayer), iOS and PC/MAC/Linux on Steam. The Web version can be played in a limited demo fashion for free, while the base game containing 10 fighters ranges from $10-$15 depending on the platform. An additional expansion of 10 more fighters can be purchased in game for $15. The Steam version can be played single player versus two levels of ai, and all versions support cross platform multiplayer. 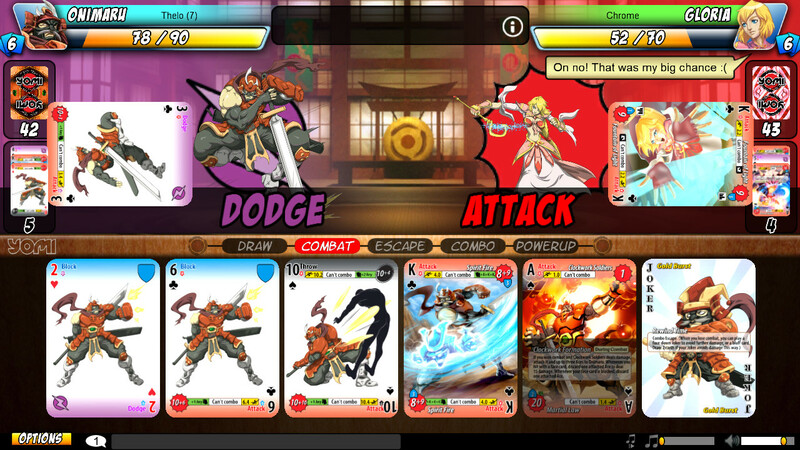 Yomi is a competitive card battling game themed around traditional 2d fighting games. The player chooses a fighter from a selection 10, or 20 with the expansion. Each fighter has its own deck of cards and unique play style. The game is touted for its varied yet balanced play, and is played competitively at events and conventions in real life and digitally online. After the starting hand is drawn, each player chooses a card that is played simultaneously. Each card can be played 2 different ways, with the active side of the card facing the opponent. The played card will either be played as an attack, throw, block or dodge. These actions function as a rock/paper/scissors mechanic, with a few twists. 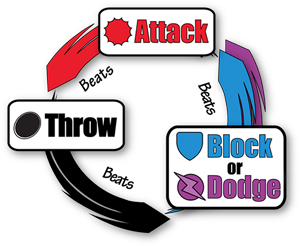 For example, a dodge beats an attack and provides an opportunity to respond with a single move (card), an attack beats a throw and opens up a chance to start a combo by playing chain-able attacks, and so on. This combat system is very easy to learn, yet is full of subtle strategic nuances that provide deceptively deep tactical mechanics that keep the action interesting. The app version of the game is very well constructed and supports a host of features such as a clean smooth interface, in-game chat, live game spectating and replay support. The magnificent art from the physical game looks vibrant and is presented at 4x the resolution in the Steam version as compared to the Web version. The app leverages the digital format by providing per-card stat tracking. "Upgrade cards" are awarded for playing that can be used to craft enhanced versions of the cards that provide the tracking of more stats, and then upgraded further to turn them into foiled shiny bling. These enhancements can be useful for analyzing what is and isn't working in your character/deck strategy, but none of these enhancements directly effect play. There is no pay to win mechanic and all players have equal tools at their disposal. An interactive tutorial is included that does an excellent job of explaining the basics of the game. The game enjoys an active community with many resources to assist new players, and to help existing players get a head start on playing unfamiliar characters/decks (refer to the links at the top of this post).